TAKE (meaning Bamboo) hex wrench is designed to fit perfectly in your hand, giving maximum torque for hard to shift, rusty bolts. Luxury portable hex set from Runwell, Japan. Stainless steel CNC cut barrel shape in the middle makes easy to grip despite 70mm small length. Portable 4/5mm hex wrench set. Ninja style hand-braided strap gives you extra grip. Leatherman - Wave Multi-Tool Black oxide finish. Leathermans best selling multi-tool, now re-designed. Larger knives, stronger pliers, longer wire cutters and all locking blades make the new Wave an essential piece of equipment for outdoor enthusiasts and professionals. All the essentials for fixing the most common bike issues. 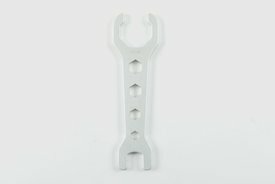 Lightweight aluminium multi-spanner from Viva Japan. Suitable for any bike. Every Japanese craftsman uses TRUSCO box. They are strong and long lasting tool box. This T190 can pile up the same box on top and they won’t slip or make a mess in your workshop.